Maps are changing. They have become important and fashionable once more. 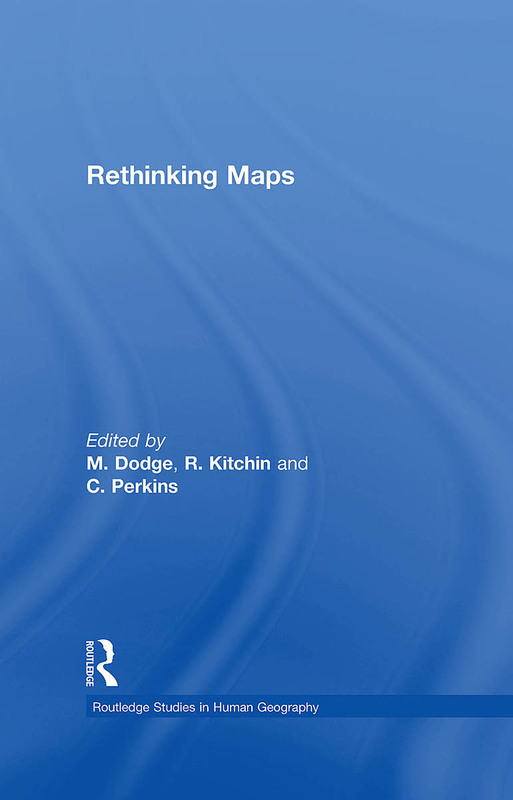 Rethinking Maps brings together leading researchers to explore how maps are being rethought, made and used, and what these changes mean for working cartographers, applied mapping research, and cartographic scholarship. It offers a contemporary assessment of the diverse forms that mapping now takes and, drawing upon a number of theoretic perspectives and disciplines, provides an insightful commentary on new ontological and epistemological thinking with respect to cartography. A useful overview of what typically gets called “critical cartography,” with a few other voices of reason mixed in. Denis Wood and I contributed a chapter, a comic with plentiful notes (for those who can’t figure out the pictures). I linked our chapter below, but it works much better as a printed comic. I have about 10 paper copies, and can mail them to the first 10 people that email me (jbkrygier@owu.edu). Include a mailing address! Serious enough, I guess, to be included in a tome of high academic scribblings. The editors have made the introductory and concluding chapters available as PDFs. Those too are linked below. The book is expensive ($129.95!) and sales will mostly be to libraries. Check a copy out of your favorite library (or ask for it via inter-library loan) or email the author of a chapter you are interested in and ask if they are willing to share a copy. Here is an easier to read PDF version of Ce N’est Pas le Monde. The proliferation of mapping sites on the web provides ample fodder for critique by the map police (cartographic insiders). I usually feel a bit bad whining about the cartographic limitations of such sites. Cartographers have a history of obsessing with rules and such obsession has, arguably, limited creativity and undermined innovations. Bad cop. However, not following the rules does not necessarily produce creative and innovative mapping. I, for one, don’t entirely enjoy being the map police, but will try to at least be a good cop. 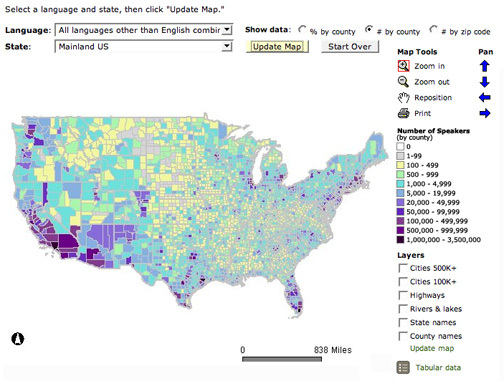 The basic language map allows you to view 33 different languages, mapped by county in the U.S. The total number of people who speak a particular language (above) can be mapped, but mapping totals can be deceptive, as the sizes of the counties vary. Thus a county may have more speakers of a particular language just because it covers more area than a smaller county. To account for these variations in county size, map the data as a percentage (the percent of people in a county that speak a particular language, see below). But you can map totals and there are sometimes good reasons to do so. Just realize the potential limitations of what you are seeing.